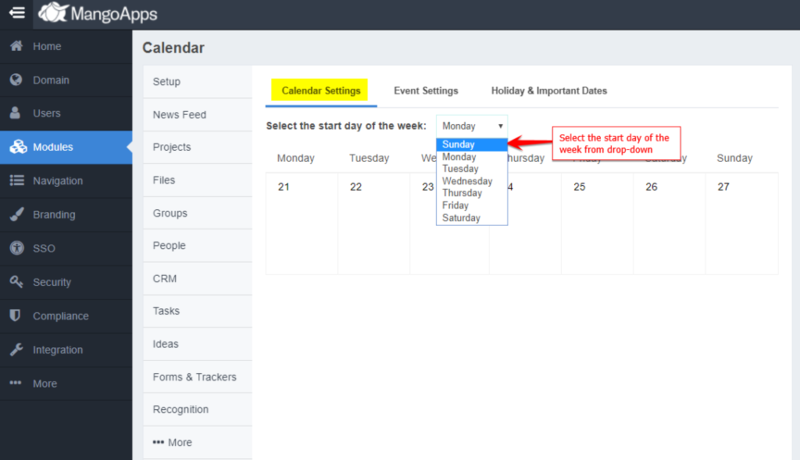 /Calendar & Events /How Can Admin Change Start Date of the Week in Mangoapps? Based on the country, location and demographics of where the company/organization is based out of, the Start Date of the Week may be different for different companies. The network admin can configure the start date of the work week for your company. MangoApps calendar will adjust itself and start the week from the day configured. After the admin makes the changes to the admin portal, the start date gets changed on the network portal. The user can view the changes to the start date of the calendar on the Calendar module of both Global Navigation and Local Navigation inside the team. Below is the video of how the changes to the start date of the week in the admin portal, gets reflected on the User portal.